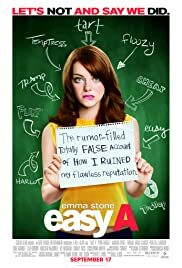 BEFORE: It’s been a few hours since Here Comes the Boom and it’s time for today’s second film, the 2010 comedy Easy A. It also sticks with the school theme but I’m anticipating Easy A will be a bit more risqué and obscene than Here Comes the Boom. AFTER: Any film that references classic films or breaks the fourth wall and does it well usually gets a good mark in my book. It’s part of the reason I liked Pitch Perfect and Looper just to name a few recent examples. As a fan of movies it’s always great to see references to some of the greats because it adds an extra layer of relatability. Easy A does this by referencing John Hughes and works associated with The Scarlet Letter. This doesn’t make Easy A a perfect film, but it certainly gives it a boost. It’s really an all-around fantastic job. There is the right balance of comedy and drama, amusement and seriousness. It is never so funny that you can’t sympathize with Olive Penderghast (Emma Stone) but it also isn’t too solemn that you feel laughter is prohibited. Some of the credit needs to go to the director, Will Gluck, but also the actors. Stone does a great job with her complex character that has many qualities to like but also some actions that can draw stares. Other stand-out performances belong to Thomas Haden Church as the English teacher and especially Stanley Tucci (last seen in Margin Call) who continues to be at the top of his craft. A few minor annoyances I have are with some stylistic choices: Olive’s voice-over/webcast and the rumor-spreading scenes. Using the webcast for the voice-over was a good idea and fit in with the modernization ofThe Scarlet Letter but I felt it was relied on too much and distracted from the story. As for the rumor-spreading scenes, again, a cool idea to speed up the action but I don’t think it is the most effective way to get the information across. Easy A is certainly well worth your time. There are some great characters and it is a great modernization of a classic story (which I haven’t read but it certainly seems like a good modernization).